"Sport today is too much of a game to be a business; and too much of a business to be a game." This oft-quoted statement describes the unique nature of the sport industry. The Husson University Sport Management program, housed in the College of Business as part of the School of Hospitality, Sport, and Tourism Management, effectively blends these two distinct fields of study – sport and business administration in an effort to prepare students for careers in this field. We use the term "sport" as an all-encompassing concept that captures not only sports performance (those activities related to amateur, intercollegiate, and professional athletics contests); but also sport production (including sport equipment and apparel); and sport promotion (e.g., marketing, licensing and broadcasting aspects) as well. Sport management majors can choose from a range of courses depending on their areas of interests: sport marketing, sport psychology, sport facilities management, sport law, sports medicine, and sports in society to name a few of those currently offered. Sport is a multi-billion dollar per year global industry. At Husson, we focus on the business of sport, not solely on the sports themselves. To put it another way, you do not have to dress out for your sport management classes, but you will have to dress up – "it's a business." "Management" is an equally important descriptor of our program. Management involves the achievement of organizational objectives by working through, and with, others. Our students take the full range of general business courses that are required of all business administration graduates – economics, principles of accounting, managerial accounting, business law, business policy, organization and management, and business ethics. Graduates earn the Bachelor of Science in Sport Management, and are prepared for entry-level management positions in sport organizations; for graduate assistant opportunities in intercollegiate athletics administration or coaching; or entry into any other business field for that matter. Management is transferable, and the interpersonal skills and professional competencies that our students learn as sport management majors may be transferred to other jobs in other industries. Sport management is a popular field, there are currently over 200 schools offering undergraduate majors in sport management. The competition for students is intense and thus it is critical that schools differentiate themselves in the market place. Husson University stands out because of our program – situated in the college of business, and because of our perspective. We stress a professional perspective (a career focus) and a practitioner's perspective (with an emphasis on real-world experiences). From the student's first day in the program until graduation they are encouraged to focus on career goals and career development. In the same way that competition for sport management students is intense, the competition for jobs in the field of sport management is intense as well. The sport management curriculum emphasizes experiential learning. In addition to the practical assignments integrated into the sport management courses, Husson students are required to complete at least one internship with a sport organization. Collectively these experiences contribute to the qualifications that help our graduates stand out as they enter the work force. 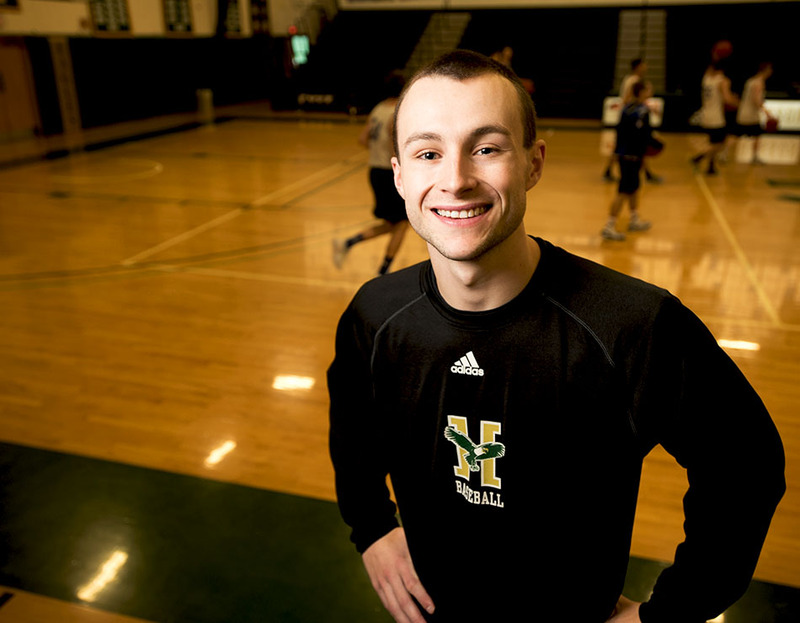 The sport management curriculum emphasizes experiential learning through the practical assignments integrated into the sport management courses and Husson students are required to complete at least six credit hours of internship experience with a sport organization. Students seeking to earn their Master in Business Administration can do so in conjunction with their Bachelor in Science in Sport Management degree in 5 years. The Master of Business Administration emphasizes the integration of theory and practice to train current and future administrators. Professional courses focus on the most current concerns facing business administrators including: legal issues, finance, accounting, human resources, managing change, strategic planning and policy making. The minor in coaching prepares students interested in pursuing a career in coaching. The minor includes study of the physical, social, medical, and strategies of coaching individual and team sports and the application of these principles in an actual coaching setting through a practicum experience. The minor fulfills the state of Maine coaching endorsement requirements. The minor in Tourism and Recreation Management prepares students to pursue careers options in the tourism and outdoor recreation field. The minor provides basic knowledge of recreation, tourism and park services, and an understanding of the benefits of leisure and recreation in our society. To complete the minor, students must take 18 hours of required courses which will provide undergraduates with the opportunity to explore recreation, parks, and leisure services.